Where better than to view the latest SEGA products for 'Sonic the Hedgehog' the iconic blue anthropomorphic hedgehog that has the ability to run at supersonic speeds than Mercedes-Benz World at the historic Brooklands racing circuit. Our Children, Amber 9 and Jacob 2½ were treated to a one-off afternoon of fun activities including face painting, testing out the latest Sonic game and even speeding around in electric Go-Karts! After meeting the SEGA team, Amber and her friend went to get their faces painted whilst Jacob played cars with the 'Sonic & Knuckles Meccano Chemical Plant Racing Playset'. 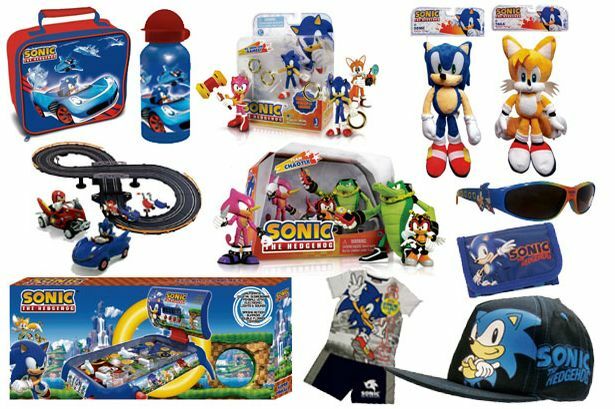 It gave me a chance to look at the wide range of 'Sonic the Hedgehog products now available in the 2013 product catalogue. There's everything from plush toys to bedding, t-shirts to personalised cakes and even a Sonic bike - Sonic's come a long way since I remember playing the original game on my Mega Drive in the early 1990's! Now looking the part with her Sonic facepaint, Amber climbed in her Medium Speedster for a few hot laps of the Brooklands Hall. They were timed laps so everyone under 1.5m had a go, but I think she must have had at least 15 goes! At a more leisurely pace, Jacob didn't hesitate to try out the 'Little Learners Drivers Zone' that's available to the public for 3-5yr olds. He absolutely loved testing his road skills on a specially built indoor road course behind the wheel of a miniature SL-Roadster! After a spot of lunch and some flag making, our daughter and friend tested the latest Sonic racing game 'Sonic & All-Stars Racing Transformed' - an improved sequel to the last game where players can alternate between car, boat and plane modes and where you can earn boost by drifting around corners or performing tricks whilst in the air. With new weapons and challenges as well as old favourites, this is must for any Sonic or Racing fan. Our Super Sonic afternoon came to a close with a Medal Ceremony for all the children where the received a certificate, medal and goodie bag to remind them of their racing experience and Sissel Henno head of brand marketing at SEGA Europe thanked us for coming! ...no problem, anytime! We wrapped up the afternoon by looking around the excellent 'Mercedes-Benz World' exhibition (which is free to the general public) something for the bigger kids as well as the little ones. Apart from the Formula One, historic and modern sports cars to look at they offer several driving experiences to suit any ages over 1.5 meters tall.